Police officers investigating a number of road traffic incidents in the wider Lisburn area on Sunday, January 28 have appealed for witnesses to come forward. A post on the PSNI Lisburn Facebook page said: “At approximately three o’clock a gold coloured old-style Renault Scenic was spotted acting suspiciously on Ogales Road in Upper Ballinderry. 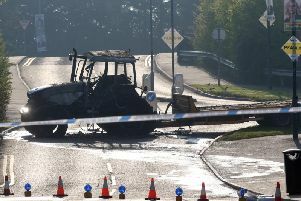 At four o’clock what we believe is the same vehicle crashed into a family car in the Kesh Road and made off without stopping before finally being set on fire on Pond Park Road East convenient to Oldpark Road at 4:25. The car contained at least two males and may not have had number plates fitted. Investigating officers have appealed for anyone who saw the car around the Lisburn area on Sunday to contact them on 101 quoting CCS 920 28/1/18.